The theme of this event is world dance. This theme was chosen to draw attention to the fact that people of different nationalities and cultures live in Tower Hamlets. Members of the community will have the opportunity to get acquainted with the dances of different parts of the world and with their history and will be able to learn for themselves to dance in different world dances. 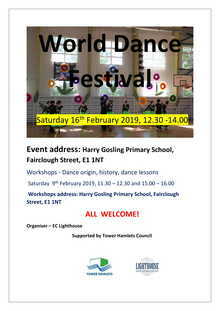 The workshops will be take place on 9 February at Harry Gosling Primary School, Fairclough St, Whitechapel, London E1 1NT. All are welcome but advance registration is required. Please email info@eclighthouse.co.uk to book your place. During the workshops various world dances will be presented and their history and origin explained. Local community members will have the opportunity to learn the dances, they will have a good time and commune with each other. The workshops will be run by professional dancers and lecturers. At the end of this project there will be an event with a professional dance concert programme. They will dance Argentine, Spanish, Lithuanian, Indian, English and other dances. 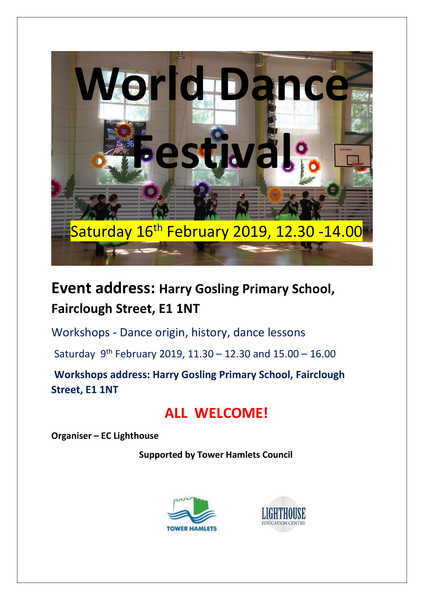 This event will take place on 16 February at Harry Gosling Primary School, Fairclough St, Whitechapel, London E1 1NT and all are welcome.